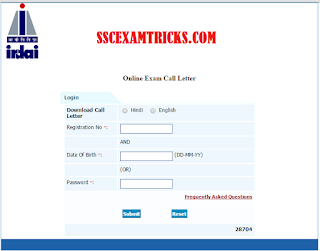 IRDA Assistant Admit Card 2015 Released– Download IRDA Rajbhasha Assistant Hall Ticket 2015 at www.irda.gov.in – The purpose of this page to information you about IRDA Assistant Admit Card 2015, online examination syllabus with latest pattern, process to download call letters, summary of IRDA Assistant / Rajbhasha Admit Card 2015 containing information about online exam date, Admit card release date, start date & end date of online registration etc. Insurance Regulatory Development Authority (IRDA) online examination has scheduled to be held on 20th August 2015 for 24 posts of Assistants & 01 post of Rajbhasha Assistant. The latest news is that IRDA has uploaded Assistant Hall Tickets on the official website www.irda.gov.in. A huge numbers of candidates are going to appear in this online examination and waiting for their hall tickets. These candidates can download their Admit card from the direct link provided below. Earlier Insurance Regulatory Development Authority (IRDA) had invited online applications from 17th June 2015 to 10th July 2015 on the official website www.irda.gov.in for 24 posts of Assistants and 01 post of Rajbhasha Assistant. A huge numbers of candidates had applied for these posts. Selection Process: The final selection of the candidates will be based on merit list prepared from marks obtained in online examination and personal interview of the candidates. The online examination has scheduled to be held on 20th August 2015 for both Assistants and Rajbhasha Assistants posts. The result will be published within 2-3 days after online examination. The qualified candidates will be called for interview which will likely to be conducted in last week of August 2015. IRDA Assistant Syllabus with latest Exam Pattern: The online examination will be conducted on 20th August 2015 at various centres by pen and paper mode. The objective type examination will contain 200 multiple choice questions displayed on the schedule time on the computer. The online examination will be held for 2 hours. There will be 0.25 negative marking allotted per wrong answer deliver in online examination. 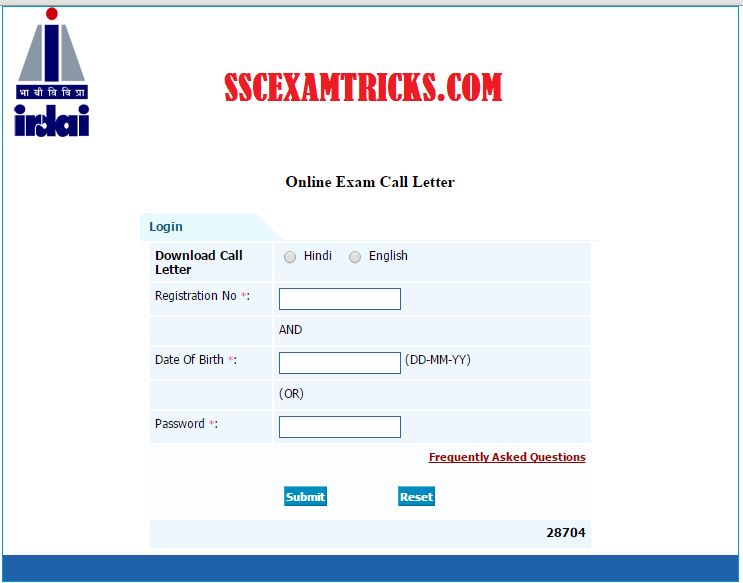 Few steps are discussed here which will be helpful to download Admit Card for online examination. Step 1: Click on the direct link given above. The official page will be displayed on the screen. Step 2: Choose your language for Admit card from given options i.e. English & Hindi. Step 3: Enter your Registration ID & DOB. Step 4: Press ‘Submit’ button provided at the bottom. In case, anything go wrong, click on ‘Reset’ button and revise step 1 to step 4 again to download Admit card. Now, finally you are surely have detailed information about IRDA Assistant Admit Card 2015 and process to download hall tickets. So download your admit card which is an entry card for examination hall.